“Google, find Chinese food near where I am located.” Or, “Alexa, is there rain in the long-range weather forecast?” Let’s face it, everyone we know is barking orders into the air and getting results. Are so-called smart speakers a new world with staying power, or a passing trend that will give way to the next big thing? Gildshire began an investigation that involved turning an ordinary home into a smart home. When Gildshire undertakes a task, half measures are not tolerated. We set out to change an everyday abode into the smartest home in town, and by that, we mean the ENTIRE house, including what’s outside. First off, finding the home that we could turn so intelligent that the rest of the cul-de-sac will be jealous. The test house would be the one type of house that is most commonly constructed today. That means four bedrooms with two full baths. Our genius-to-be home includes a large living room, along with a separate dining area. Outside, there is a functioning garden next to the driveway. 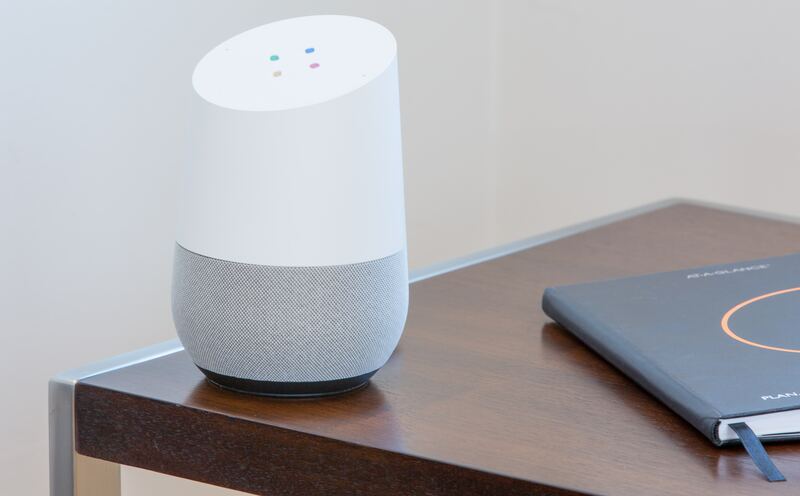 The foundation stone to transform a traditional home into one that is smart is the smart speaker. We want the best and most functional one around. Can we get all of that in one package? Yes, its called Google Home and is the most popular on the market. It cost $74.50 on eBay. We’ll require seven of them since the bedrooms, kitchen, living and dining rooms all need intelligence. Our Smart Home running total is $521.50. A home this size needs, on average, 45 light bulbs. That sounds like a lot, but count them up in your home, and you will probably come close. Phillips Hue gave us the best bang for our lighting buck at $14.95 a bulb. Outside, the garden needs bulbs too, but a different kind of bulb. Remember, they have to be weatherproof. That brings us to a total of $672.70 for interior lighting, $89.25 for exterior illumination, and a dimmer switch from Best Buy for $38.75. Our Smart Home running total is $1322.20. We will require programmable door locks front and back, and the Yale Assure Smart Lock looks like the right answer. They’re on sale right now for $149.95 at GoKeyless. Our Smart Home running total is $1622.10. You’ve seen the national advertisements for the Ring smart doorbell. One reason they are getting so much airtime is that Amazon recently purchased Ring. The Big A lowered the price from $179 to $100, and we only need one for the front door. Our Smart Home running total is $1722.10. “Smart” electrical outlets are wonderful inventions. They turn your standard heating/cooling systems into virtual heat pumps. When the first autumn chill is in the air, your smart plug fires up the heater. “I’m sorry, are you too warm? Not to worry. The sound was the A.C. starting up.” We will need smart plugs for the dining room, and kitchen, and of course the bedrooms all need their own. A four-pack purchased from the Big A will set us back $33.99 each. Two are left over, but $135.96 is a good deal. Our Smart Home running total is $1858.06. In this day and age, exterior cameras are smart choices in and of themselves. We will require one in the front of the house and one that covers the back. The Admiral 1080P, HD Two-Channel Security Camera System starts at $709.00. Our Smart Home Running total: $2567.06. Nest offers an excellent alarm system set-up for $320.00, and it’s DIY if you are good at that sort of thing. If not, or if professional coverage is what helps you sleep at night, a monthly contract with Brinks, SimpliSafe, or ADT is your best answer when it comes to security. Either way, Gildshire doesn’t judge, because your safety is your business. That said, Nest is available at Home Depot, but the price we quoted is only found on eBay. Our Smart Home running total is $2887.06. Finally, let’s send the garden area to college. A smart irrigation system tracks your hyper-neighborhood (that means right there at your very house) weather conditions, monitoring for the best times to water. It skips the next watering entirely when it rains. In our opinion, Rachio 3 is the best choice. Amazon sells it at $229.99. Our Smart Home final total is $3117.05. So, that’s the best there is when it comes to smart home gizmos, and all for just over three thousand dollars. Good luck from Gildshire as you embark on this worthy project. We can’t wait to come over for the Smart Housewarming, and we will even bring the Bundt cake! It is the least we can do for someone as smart as you.